Raquel Rub was born and raised in Lima, Peru. Her interest in art began as a young child. She studied Oil and Acrylic Painting at Brooklyn College, New York in 1956. Back in Lima, Peru, Raquel continued her studies in Pastel and Oil Painting at the Academy of Suarez Vertiz in 1957. She earned her degree in Interior Decoration at the Escuela de Decoración Interior de Miraflores in 1968. Relocating to Miami, Florida in 1974, Raquel continued to take art classes and workshops with Ilse Grinstein, Peter Rubino, Nilda Comas, Eugene Daub, Susan Luery, Paul Lucchesi, Judy Williams, Wayne Pelke, and currently Robin Katz amongst other artists. Raquel is an accomplished and prolific artist working with different media such as watercolor, acrylics, oils, metals, ceramics and stones. Traveling to different parts of the world, Raquel always found the sculptures she encountered irresistible to touch. 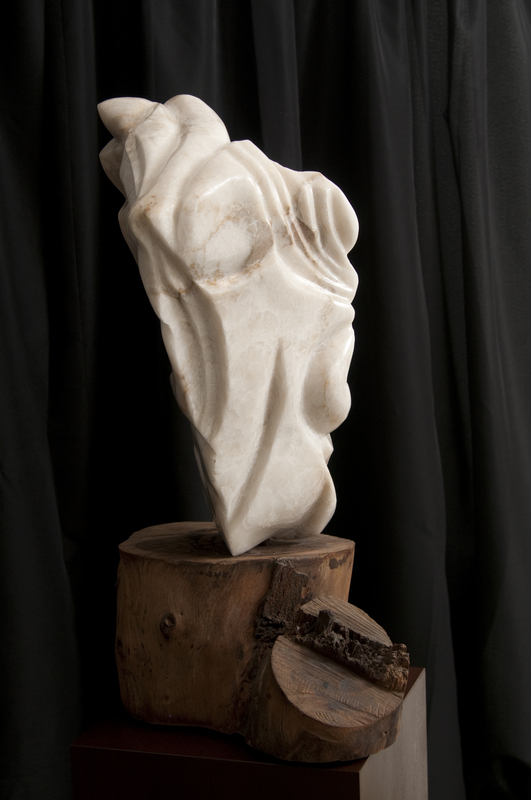 Her desire to understand the art of sculpting, prompted Raquel, to pursue studies in stone sculpting with Salvatore Zagami. Through this medium her spontaneity, creativity and fascination with sculpting materialized piece after piece. Raquel earned her first award in 1967 for “Kindling Light” an oil painting exhibited in Lima, Peru. She then won an award for “Menorah” a bronze sculpture in 1972 in Lima, Peru. “Menorah” is part of the permanent collection of the Jewish Museum in Miami Beach, Florida. Raquel has earned numerous awards for her ceramic and alabaster sculptures and continues to showcase exhibitions in Miami-Dade and Broward Counties in South Florida. Her first solo show was on April 2009 at Caridi Gallery in North Miami, Fl. Her second show is a mother and daughter exhibit which is currently showing at Maor Art Gallery in Miami, Florida from February 12th through March 7th, 2011. Raquel is an overall humanitarian and a philanthropist. She is an active participant in the Jewish community. She served as president of Eshet Chayil Cultural Group in Peru from 1973-1974. Raquel was the president of Na’amat OR Chapter of Miami from 1983-2005. Since 2005 to the present day, Raquel serves as the Na’amat South Florida Regional President. The State of Israel Bonds honored Raquel as a “Woman of Valor” in 1993, and honored Raquel and her husband Dr. Moises RubO.B.M. in 1999 with the ‘Celebration of Life’ award. The Jewish Museum, Miami Beach, Florida, chose Raquel and Dr. Moises Rub O.B.M. as part of Miami’s 2002 Distinguished Latin American Families exhibit, ‘El Viaje’. She is a dedicated mother and grandmother and she is actively involved in activities with her grandchildren in whom she instills her joy for the arts.